Criminalize Conservatism: U.S.: NOT A "Christian Nation"
U.S.: NOT A "Christian Nation"
Today's post is a follow-up to yesterday's piece, "Right-Wing Religion Kills," a first-time article for this site, covering two posts, "Violating the Constitution by the Religious Right: We Are Not a Christian Nation," by Walter Brasch at Truth-out.org/Buzzflash.com, followed by an essay, "God Is With Us": Hitler's Rhetoric and the Lure of "Moral Values," by Maureen Farrel at Buzzflash.com. "He wasn't the only priest who used the pulpit to attack the President. Bishop David Lauren of Green Bay, Wisconsin, told his congregations that voting for Obama and other candidates who were pro-choice or who believed in embryonic stem cell research or gay marriage could put their 'soul in jeopardy.' Others, primarily from evangelical Protestant faiths, were even more adamant in their religious intolerance, declaring that voting for Obama would definitely condemn their souls to Hell. 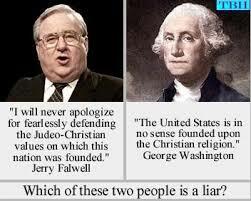 "The right-wing believe that America is a Christian nation and should elect only like-minded Christians to office. Even many Christian religions, such as Unitarianism, are suspect in the eyes of those who absolutely believe they absolutely know God's intent, and everyone else is wrong. They support Israel, far closer to being a socialist nation than the US ever will be, as a Biblical necessity, but would be conflicted if a Jew should ever become a major party candidate for president. 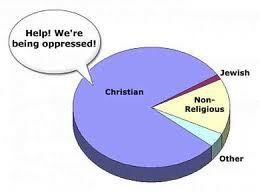 "The religious bigots claim the US was founded by Christians and is a Christian nation - or, reluctantly, say it is a Judeo-Christian nation. But, no matter how much they screech, the facts don't support their beliefs. George Washington declared, 'The government of the United States is not in any sense founded on the Christian religion.' John Adams and the Senate later ratified a treaty with those exact words. "Most of the Founding Fathers were primarily deists, not Christians, and specifically rejected many Christian beliefs, including the virgin birth, the resurrection of Jesus, and that the Bible was written by God. They also believed that God, having given mankind the power of reason, then stayed out of the lives of His people. Among the deists were Washington, Jefferson, Franklin, Madison, and Monroe. But they and the other Founding Fathers were explicit in their declaration, embedded into the First Amendment that established the principle that all people had a right to their own religious beliefs. "Several distinguished historians (including Drs. James McGregor Burns and Richard Hofstadter, each of whom won the Pulitzer Prize for history) have pointed out that in 1776 and much of the 19th century, as much as 90 percent of the population did not identify with the Christian church. "There is another aspect to the First Amendment, often overlooked by those who don't know history or Constitutional law, yet believe they do. Jefferson, in his first year as president, in a letter to a Baptist congregation, referred to the intent of one of the five parts of the First Amendment as 'building a wall of separation between church and state.' Numerous times, the Founding Fathers had reaffirmed this separation, creating what became known as the 'establishment clause' in 1787. Several rulings by the Supreme Court reaffirmed this doctrine. "However, 28 percent of Americans, according to a First Amendment Center poll in February, don't believe there is a Constitutional separation of church and state..."
"One might expect regular citizens to be ignorant of history, but a Supreme Court Justice? Does he imagine that the phrase 'Gott mit Uns' was a German clothier's interpretation of "Got Milk"? 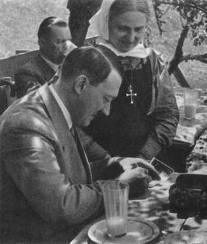 "For anyone wanting even more proof, Mein Kampf is chock full of the Fuhrer's musings on God. ("I believe that I am acting in accordance with the will of the Almighty Creator: by defending myself against the Jew, I am fighting for the work of the Lord," Hitler wrote). 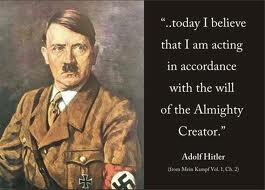 But anti-Semitic rants aside, some of Hitler's religious musings (were) interchangeable with Mr. Bush's. 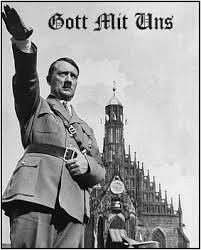 "Hitler was raised a Catholic and spoke of his faith in God, yet, singling out his rants against religion, politicians and pastors continue to characterize him as a pagan barbarian. Such distortions are convenient -- particularly in an age where propaganda concerning 'moral values' is readily gobbled up and Christian nation legislation waits in the wings -- but, to paraphrase the Bible, overlooking the truth will not make us free. "Saying that neoconservatives believe that secular society is undesirable 'because it leads to individualism, liberalism, and relativism, precisely those traits that may promote dissent that in turn could dangerously weaken society's ability to cope with external threats,' Lobe explained why Kristol and other neocons have 'allied themselves with the Christian Right' and, in some cases, have also denounced Darwin's theory of evolution. 'Neoconservatives are pro-religion even though they themselves may not be believers,' Reason magazine's Ronald Bailey explained, pointing to publications like Commentary which has espoused the virtues of religious fundamentalism and has questioned evolutionary science. "Although several others, including the legendary Seymour Hersh, have noted the neoconservatives' belief that deception is essential, the religious aspect of their philosophy is especially unnerving. Religion may be the opium of the masses, but when zealots become so certain of their own righteousness that they ignore their own humanity, horror is the natural consequence. Islamic extremism offers the most glaring recent example, and now that Osama bin Laden has been granted permission to nuke America, the most extreme changes within the U.S. could very well come from the outside world. "In the meantime, however, for those who have not yet noticed, our own homegrown zealots -- those who advocate hatred in the name of the Lord -- have made considerable headway, with gays and lesbians currently at the center of legislation which, should it pass, will alter this country forever. "When the Marriage Protection Act passed the House in July, the New York Times called it 'a radical assault on the Constitution.' If it passes in the Senate, the bill could obliterate the separation of powers and wipe out Constitutional protections for all minorities, stripping the courts and possibly paving the way for Christian nationhood. Other pieces of court stripping legislation bills designed to topple the wall between church and state are also in play. "While many of us reserve a soft spot for true Christian generosity and the warm teachings of Jesus, it's important to remember that Christianity can be (and has been) distorted for darker purposes. Whether you're talking about Nazi Germany, the pre-Civil War American South, or the atmosphere in the U.S. these past few years, whenever questions of conscience are vigorously denounced, you can bet there is trouble ahead -- and the hijacking of faith and the manipulation of religion should always arouse suspicion. Moral values as a mandate? What better way to foster civil obedience and "One nation Under God" unity in a time of preventative war, suppressed liberty and sanctioned torture. "So, yes, despite tales of Hitler's atheism and Germany's Godlessness, the list of Hitler's religious assertions and Nazi Christian affiliations is long, and before Americans swallow more WMD-type baloney, it's best to comprehend this history and understand that no nation, including our own, is immune to faith-based fascism. "Substituting 'America' for 'Germany,' many of Hitler's religious assertions could have been uttered by Jerry Falwell or Pat Robertson -- with Hitler even asserting that God punished Germany for turning away from Him -- before promising that renewed piety would protect the Fatherland and make it prosperous and successful once more. 'Once the mercy of God shown upon us, but we were not worthy of His mercy. Providence withdrew its protection and our people fell, fell as scarcely any other people heretofore. In this deep misery we again learned to pray,' Hitler said in 1936, sixty-five years before Falwell and Robertson blamed abortionists and feminists for the tragedies of Sept. 11. "Speaking in Berlin in March, 1936, Hitler said something remarkably similar. 'I would like to thank Providence and the Almighty for choosing me of all people to be allowed to wage this battle for Germany,' he said, before launching the preventive war heard round the world. "Both leaders also promised peace while planning for war. 'We seek peace. We strive for peace. And sometimes peace must be defended,' Bush said, in his State of the Union address in Jan. 2003, two months before launching a preventative war in Iraq. 'Never in these long years have we offered any other prayer but this: Lord, grant to our people peace at home, and grant and preserve to them peace from the foreign foe!' Hitler said in Nuremberg on Sept. 13, 1936. "If positive Christianity means love of one's neighbor, i.e. the tending of the sick, the clothing of the poor, the feeding of the hungry, the giving of drink to those who are thirsty, then it is we who are the more positive Christians. For in these spheres the community of the people of National Socialist Germany has accomplished a prodigious work." (Feb. 24, 1939)"
"The world you live in -- "your nation, your people" -- is not the world you were in at all. The forms are all there, all untouched, all reassuring, the houses, the shops, the jobs, the mealtimes, the visits, the concerts, the cinema, the holidays. But the spirit, which you never noticed because you made the lifelong mistake of identifying it with the forms, is changed. Now you live in a world of hate and fear, and the people who hate and fear do not even know it themselves; when everyone is transformed, no one is transformed. Now you live in a system which rules without responsibility even to God. The system itself could not have intended this in the beginning, but in order to sustain itself it was compelled to go all the way." "Of course, America has hardly 'gone all the way' and is unlikely to become as psychotic as Nazi Germany any time soon. But what do you suppose God thinks of preventative war based upon deception? Or about the use of depleted uranium? Or about dropping napalm on civilians? Are Iraqi insurgents are any less certain that God is on their side than our own Evangelical Marines? "Yes, Saddam Hussein was a brutal thug, but why do so many insist on forgetting that the U.S. helped him to power in the first place? Does God see our role in all of this as lightly as we do? And how many U.S. citizens do you know, who, mired in fear, readily dismiss America's use of torture and rationalize our disregard for international law? What else might they overlook? "In 1937, Hitler said that because of Germany's belief in God and God's favoritism towards Germany, the country would prevail and prosper. "We, therefore, go our way into the future with the deepest belief in God. Would all we have achieved been possible had Providence not helped us? I know that the fruits of human labor are hard-won and transitory if they are not blessed by the Omnipotent. Work such as ours which has received the blessings of the Omnipotent can never again be undone by mere mortals,"he said. 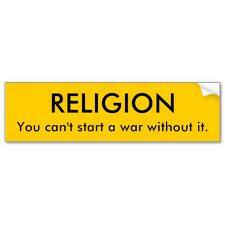 "There (was) no more crying down of religion in George Bush's America, either. Though oft-repeated assertions made by the media in the immediate aftermath of the election have proven to be nothing more than myth, propagandists would have you believe that the American people have spoken: Moral values' reign supreme. "But how can any one of us know God's desires -- especially when our enemies claim to have God on their side as well? And doesn't it seem that religious hubris -- believing that God sanctions one's own inhumane treatment of others -- always invites a fall? "'I tremble for my country when I reflect that God is just; that his justice cannot sleep forever,' Thomas Jefferson said, of the price America would eventually pay for slavery. 'Nations, like individuals, are punished for their transgressions,' Ulysses S. Grant advised, describing karmic retribution without pointing hateful fingers at lesbians. "And long before that, the poet John Milton tried to 'justify the ways of God to Man.' But yet, the world, with its conflicting visions of morality, ethics and truth, still struggles to comprehend. "Perhaps Truth, for want of a better definition, is what God sees when he looks at any given situation. And perhaps it is ultimately impossible for us to know God's mind. After all, it's obvious that Hitler wasn't telling the truth when he spoke of God and country -- and by the same token, it's difficult to look at Najaf or Fallujah or Abu Ghraib or Guantanamo Bay and see God's hand in any of it. "But, without knowing God's mind, most of us have only History to help us judge. And the fact is, without the benefit of History, some of the 'moral values' Hitler embraced sound eerily like those being peddled today. "George Bush (was) not Hitler. America is not Nazi Germany. But buying into religious assertions or thinking that God is on your side is not wise when it comes to matters of war -- particularly when that war is an aggressive preventative war based on false premises and assumptions. "So, aside from Jerry Falwell, who speaks with hate-filled authority, most of us do not know how God will judge us. We will have to settle for History's imperfect record. "I challenge anyone to find the moral value in that." And we challenge anyone to dispute the facts in these articles. If Conservative leaders and spokespeople know the facts and yet spout the Conservative party line, if these misstatements lead to deaths, then they must pay the price for their lies. brings you together, but do so with all your heart."